His Highness Sheikh Mohammed bin Rashid Al Maktoum, Vice President, Prime Minister and Ruler of Dubai said that Dubai is working towards cementing its position as a pivotal economic and commercial hub for the region in line with the Fifty- Year Charter recently announced by His Highness that aims to ensure Dubai’s sustained prosperity and accelerate the development journey of the emirate, the UAE and the region. H.H. Sheikh Mohammed also highlighted the role of DIFC in supporting the Eight Principles of Dubai set by His Highness, mainly the one related to the emirate’s position as a business capital and a hub for international investment. "The financial sector remains one of the cornerstones of our economy. We are keen that the development of infrastructure is matched by the development of legislation by continuously reviewing it to ensure it is among the best in the world and that it can facilitate the best environment for supporting greater excellence and achievement," His Highness said. Sheikh Mohammed also praised the achievements of DIFC that helped Dubai become one of the leading financial centres in the world. "The next phase requires the introduction of the latest technologies that can support the growth of various business sectors. We are not only trying to meet the requirements of the present time but also be a major contributor to shaping the future of the world’s economy and positively influence greater well-being for the world. 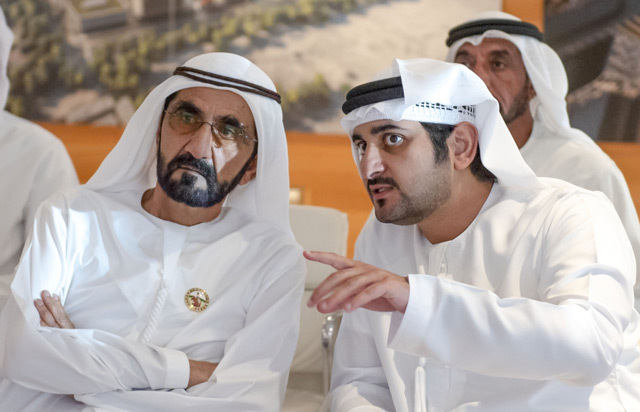 We are confident that Emiratis will be successful in achieving this strategic objective," His Highness said. His Highness’ remarks came as he approved a new chapter in the development of the Dubai International Financial Centre (DIFC) with the launch of DIFC 2.0. 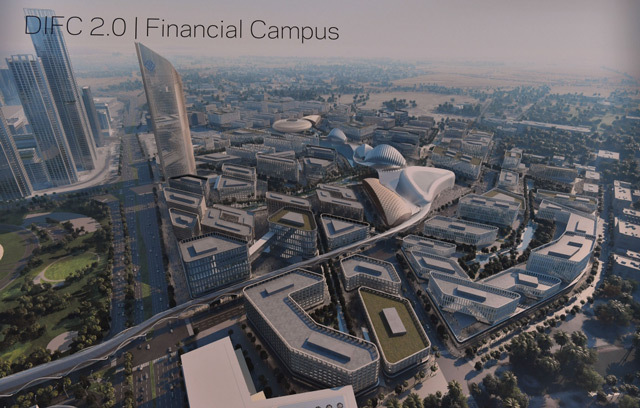 The Centre’s phased growth plan will triple the scale of the leading financial hub in the Middle East, Africa and South Asia (MEASA) region and enable DIFC to drive the future of finance. During the visit to DIFC, His Highness was accompanied by H.H. Sheikh Hamdan bin Mohammed bin Rashid Al Maktoum, Crown Prince of Dubai and Chairman of Dubai Executive Council, Deputy Ruler of Dubai and President of DIFC His Highness Sheikh Maktoum bin Mohammed bin Rashid Al Maktoum, Chairman of Dubai Civil Aviation Authority and Chairman of Emirates Group His Highness Sheikh Ahmed bin Saeed Al Maktoum, Chairman of Mohammed Bin Rashid Al Maktoum Knowledge Foundation His Highness Sheikh Ahmed bin Mohammed bin Rashid Al Maktoum, and His Highness Sheikh Mansour bin Mohammed bin Rashid Al Maktoum. Governor of DIFC Essa Kazim, briefed His Highness about the new expansion which will add a total of 13 million square feet of vibrant and stimulating space to the Centre’s integrated ecosystem. DIFC 2.0 builds on 15 years of achievement that has played a significant role in establishing Dubai’s position as a global financial hub, and a key driver of innovation and entrepreneurship. The new development will provide an international focal point for FinTech and innovation, enhancing the Centre’s reputation as one of the world’s most advanced financial centres. The development of DIFC 2.0 will commence immediately and will be completed in several stages. Upon completion, the new district will comprise 6.4 million square feet of office space, 2.6 million square feet of creative space, 1.5 million square feet of residences, 1.3 million square feet of retail space and 700,000 square feet devoted to leisure and entertainment. This will be complemented by a financial campus covering approximately 400,000 square feet, an additional 250,000 square feet of hospitality offerings, and 3.5 million square feet of car parking space. Commenting on the next chapter of the DIFC’s development, Essa Kazim, Governor of DIFC, said: "Under the wise leadership of His Highness Sheikh Mohammed bin Rashid Al Maktoum, Dubai’s government continues to undertake unparalleled initiatives to drive the Emirate’s future and to support Dubai’s role as an essential component of the global financial system. The launch of DIFC 2.0 embodies the eight defining principles upon which Dubai was founded and included in His Highness’ 50-year charter, whilst supporting the government’s efforts to foster an environment in Dubai where innovation and entrepreneurship can thrive. In addition, with the DIFC occupying a strategic position in the region, the next phase of our development will undoubtedly translate into further growth for the regional financial services landscape. Looking ahead, we are excited to continue working alongside our vibrant community, which includes some of the most prominent global financial institutions, to evolve our offering and to support the development of the financial services industry across the MEASA region." DIFC, the largest international financial hub in the MEASA region, boasts more than 22,000 professionals working across over 2,000 companies in the district, including the leading regional and global players in the financial services industry. DIFC 2.0 is an extension of the existing jurisdiction, with direct connections to Dubai’s public transport networks. Embracing a pedestrian lifestyle, the next phase is set apart from conventional city living with underground service paths allowing for the free movement of bikes, pedestrians, cars and smart transportation. With sustainability remaining a priority for the Centre, the new development will introduce open green spaces that bring together an innovative community within a natural and sophisticated business environment.